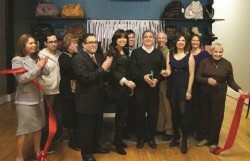 The Berwyn Development Corporation (BDC), Berwyn Main Street (BMS) and City of Berwyn were pleased to partake in the ribbon-cutting celebration for Revive Boutique on November 9. The event celebrated the Grand Opening and completion of a façade improvement to the storefront for Revive Boutique, a men’s and women’s apparel store, located at 6444 West Cermak Road. Owners Marlene Murillo and Grisel Gonzalez are Berwyn natives with a mission to bring urban-style clothing and accessories to the western suburbs. The men’s collection includes sportswear for Chicago-based professional teams, including new era sports caps, t-shirts, jerseys and more. The owners have plans to expand their boutique into a full service salon with three chairs and the capacity to provide hair services, facials, and waxing. Mayor Robert Lovero stated, “I think that Marlene and Grisel have a great concept and I’m so happy to see a small store that provides an intimate setting for shopping. It revives the Main Street feel of the corridor. I look forward to working with them as they shape their expansion concept.” Additional information on the Revive Boutique Grand Opening can be obtained through the Berwyn Development Corporation at (708) 788-8100 or visit www.berwyn.net.